My Journey So Far: I worked with TCS for about three and a half years as a machine learning engineer. That was a very technical role and I needed to learn the business side of things. That’s when I joined the Great Learning PGP-BABI program and later got an opportunity with The Smart Cube as a Senior Domain Analyst in Data Science. I Needed to Understand the Business Aspect of a Problem: Before joining the program, a lot of things were not clear to me because I had learned everything on the job without any structured or scientific approach. Not every problem can be solved in the same way. I knew a few things but wasn’t able to connect the dots by myself. Another reason was that I wanted to build my business acumen. As a machine learning engineer, I worked on the technical part of a problem but I didn’t really understand the business context and objective of performing analysis, until I took the program. Tools and Techniques I Use at Work: At Smart Cube, I use R and Python and I am not limited to just the technical part of the project, I solve real business problems in Business Analytics. Thanks To PGP-BABI, I Had a Smooth Transition: My background with machine learning ensured that I was technically sound. Great Learning’s PGP-BABI program helped me immensely in building business acumen and honing my skills. All the interactions with faculty and industry mentors helped me understand the business context to a given problem. I would say it was a pretty smooth transition. For Me, There Were Two Highlights to the Program: The faculty was excellent. They were very approachable and would clear our doubts whenever we had any. Another thing was the program structure. The curriculum was designed to perfection to suit the learning needs of all students, both beginners and experienced ones like me. Every concept was followed by a practical assignment, case study, or quiz. Hands-on training ensured a good grasp on Analytics tools. My Capstone Project Was Overall a Good Experience: The best part was that I had the freedom to choose any topic. My capstone project was about the problem to increase the production of LPG and reducing the consumption of kerosene – sentiment analysis. We also mentioned about prime minister’s Ujjwala Yojana. I Made Friends for Life at Great Learning: Thanks to the peer group at Great Learning, I learned both personally and professionally. Interacting with people from different domains and different experience levels allowed me exposure to the use of analytics in other domains. I actually ended up making a lot of friends. I have Grown Leaps and Bounds with Great Lakes’ PGP – Business Analytics Program: The most important role that the program has played in my new profile is with instilling self-confidence that I am doing the right thing. Earlier, I would always question myself if this was the right approach or right technique for a given problem. But now, I am in a capacity where I can guide others if they require help. My Advice to Aspiring Candidates Would Be: Whatever you learn, it is a must to know the concepts first. Thorough and clear concepts will help you stay confident and you will be able to move from one tool to another quickly. 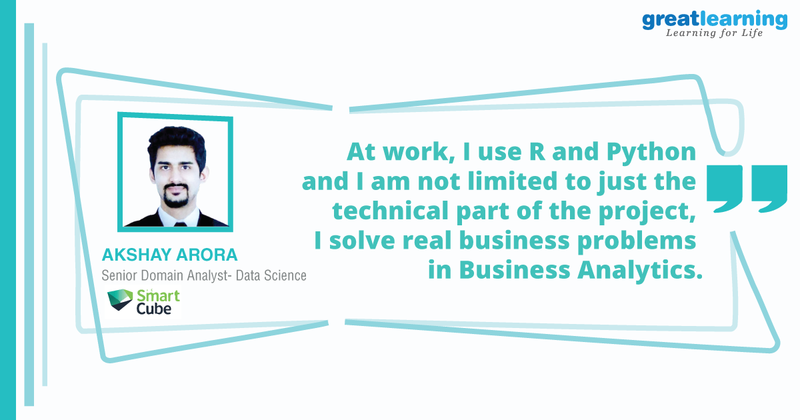 Tools like R, Python, SAS, or anything else can easily be used if the concepts of business analytics are clear. My advice is to not focus on the tools so much because in due time, your fundamentals are all that will matter while working. Another thing is that a person should approach analytics with an open mind as the techniques are the same but the domains differ. So gaining more exposure to different domains will help you develop a good understanding of analytics.